Why pay top dollar for pre-sweetened, store-bought yogurt when it's so simple to make this high-protein treat all by yourself? 2017 was all about the gut—and not just shedding extra belly flab. Everybody was talking about the health of the billions of connected neurons in your digestive tract that help with everything from inflammation to colds. And when you're talking about the gut and your diet, the conversation always starts with yogurt. Yogurt has made a name for itself in the fitness community as an excellent source of protein for repairing and building muscle after a workout. It also contains live cultures called probiotics, the microscopic "good" bacteria that keep your gut in working order. Yogurt has the added benefit of being customizable in both flavor and texture. The easiest way to tap into its versatility? Make your own. All you need to get started are half a gallon (8 cups) of whole milk, half a cup of plain yogurt with live cultures (be sure to check the label), a slow cooker, a couple of beach towels, and a lazy afternoon. Once you perfect your yogurt recipe, you won't need to buy the yogurt as a starter, so you'll save a few bucks. Store-bought yogurt isn't cheap, with a single 6-ounce individual-serving cup of Greek yogurt averaging about $1.05. Make it yourself, and you'll pay about 40 cents. Using the recipe below as a guide, experiment with the amount of time you let your yogurt sit to adjust the thickness and tang to your taste. Like a thinner consistency and mellow taste? Let your yogurt set for eight hours. Want thick yogurt with plenty of body, like Icelandic skyr? Leave it alone for eight hours, then strain it a couple of times through cheesecloth set over a bowl. Greek yogurt more your style? Twelve hours plus straining gives it a nice kick. If you like sweet yogurt, add a swirl of honey and the freshest fruit you can find at your farmers' market, either whole or pureed and mixed in. Or dip into the savory yogurt trend and make a thick, tangy creation to use as a topping in a grain bowl with quinoa, roasted cauliflower, and butternut squash. Let's say you don't get the hang of making your own yogurt right away, and accidentally let the milk and yogurt mixture get too warm, killing off the yogurt cultures (this happens at around 130 degrees F). Adopt a zero-waste mentality, and resist the urge to throw it out and start over. Separate the white solids from the yellow whey with a strainer or cheesecloth, and use the former to replace milk in baking and the latter to create a sourdough flavor in homemade bread. Your tastebuds—and tummy—will thank you. 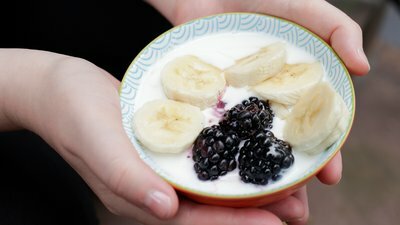 Whether you want to save a little cash, make just the right kind of yogurt for your taste buds, or have large quantities of a great protein source on hand, this simple recipe tells you all you need to know so you can do it yourself!